When Syrenka falls in love with Ezra, she doesn't realize what consequences she will set in motion for future generations. A mermaid abandoning her life in the sea for love on land comes at a price: a curse on the women in her lineage to die after the birth of their first child. Over a hundred years later, sixteen-year-old Hester is seeking answers to the reason why women in her family die after giving birth. What she discovers haunts her to her very core and comes at a price of her own. If you know me as a reader then you know three things: 1) As a rule, I don't like fantasy 2) I especially hate mythology (it's a long and storied tale that I'll save for another day) and 3) I don't do mermaid books. 1) This book won an Odyssey honor this year and I wanted to see if I would judge it worthy of such an honor. 2) Katherine Kellgren is the narrator and she is one of the best in the business. Her reading of The Incorrigible Children of Ashton Place series by Maryrose Wood is one of my all-time favorite audiobook experiences. She's one of those narrators who manages to make the book better by listening to it instead of reading it. 3) Elizabeth Fama graciously hosted a party at her house during ALA and even though she had never met many of us, she knew that we were all book lovers, and that was enough for her. After getting a chance to talk to Beth a little bit and to see what a wonderfully artistic family she has, I just knew that I would have to lift my mermaid moratorium and listen to this book. I was not disappointed. In fact, I was quite shocked at how much I enjoyed this mermaid story. It is told in two different time periods: the late 1800s, and twenty-first century Plymouth, Massachusetts. 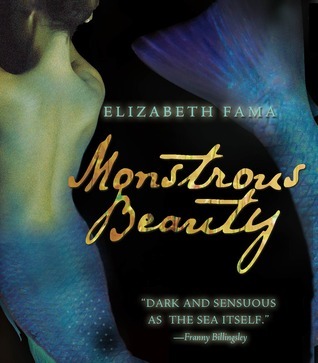 There are so many facets to this story that make it more than just a book about mermaids. It's a historical fiction, it's a family saga, it's a ghost story; there's romance, violence, tenderness, and seduction. The writing is so lush and vivid that you feel all of your senses experiencing the story as it plays out, even if you don't want to be because, quite frankly, there are some rather uncomfortable, violent scenes that occur throughout the course of this book . And don't assume that just because this is a siren story with a mermaid on the cover that it doesn't appeal to guys. I could very much see young adult males reading this book and enjoying it. It very truly is a book with something for everyone, unless you're looking for a light, uplifting romance. Then maybe this isn't the book for you. To learn more about Monstrous Beauty, check out this photographic tour of the setting over at The Midnight Garden.